This week I am feeling very excited as there is a special anniversary happening. Today it is 20 years since Harry Potter and the Philosopher’s Stone was first published by J.K.Rowling (no that doesn’t make me feel old at all!) 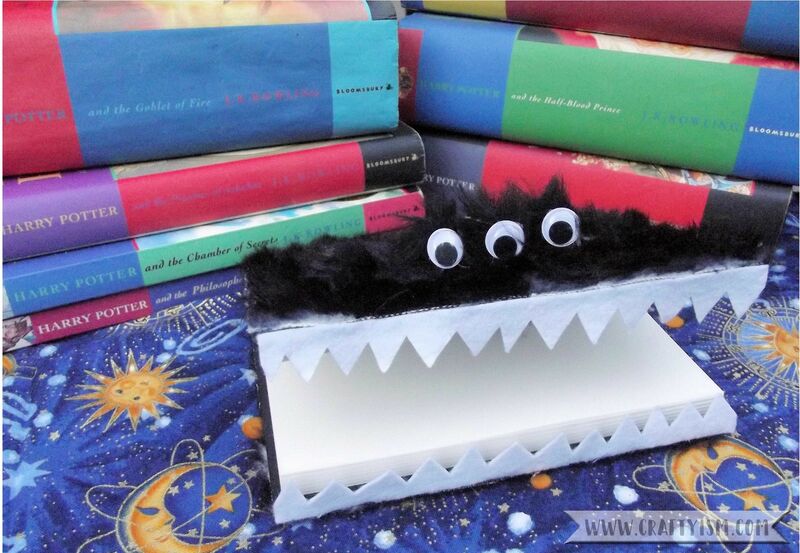 So to mark this special event, I have planned a week of celebratory Harry Potter themed crafts so that we can re-live some of our favourite HP themes, I hope you enjoy! For this tutorial I wanted to use black faux fur, but all they had in the shop was cow print! I bought it anyway because it was in the bargain bin and to turn the white patches black, I just coloured them in with a permanent marker. It actually worked out really well as it makes the fur look a little mangy. So to start, open the notebook out and lay the covers flat on the reverse side of the fur. Draw around the covers and cut out. Set this bit aside for later. Take the white felt and place against the open edge of cover. Mark and cut out two strips, these will be the teeth. 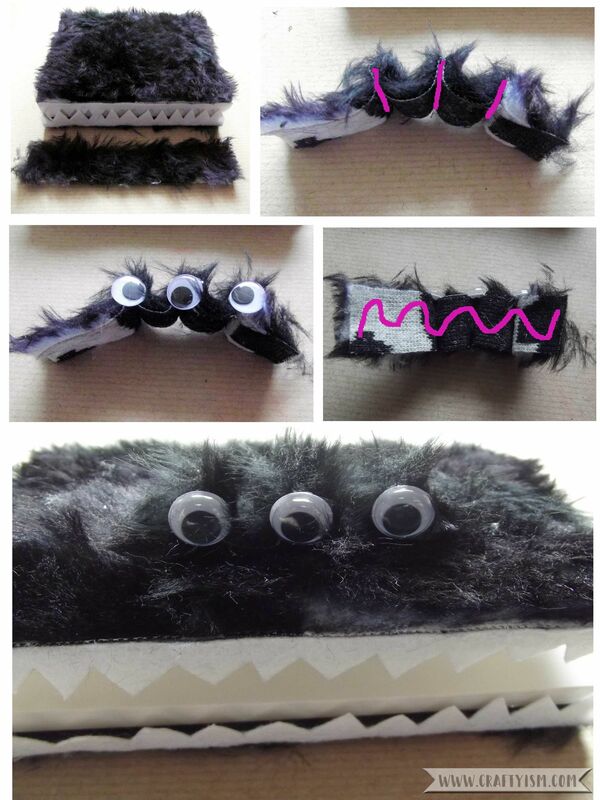 Use a pencil to draw a zig-zag line of teeth on each felt strip.Cut along the line to make two strips of teeth. Use the hot glue gun and glue a line all the way down the very edge of the open side of the cover (see the pink line on the photograph). Quickly stick on a strip of teeth so that the teeth hang over the pages. Repeat on the other side of the cover. Go back to the faux fur and wrap it around the notebook cover. Place it on a table and open up the top section of fur. 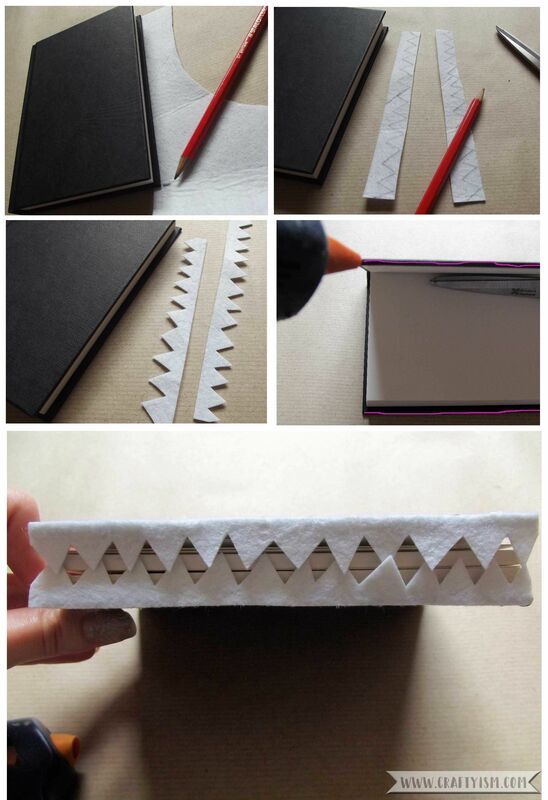 Without moving the notebook, use the glue gun to cover the spine with glue. Quickly roll the spine onto the piece of faux fur and make sure it’s stuck. Now you can apply hot glue to one cover and stick down the faux fur. Repeat on the other side. Your notebook should now have a furry cover and teeth! As you did with the white felt, cut a strip of faux fur the same length as the notebook and about 3 cm wide. This will be the eye section. On the reverse of the strip, glue a line vertically across the centre. Quickly glue two more lines evenly spaced from the centre line (see the pink lines on the photo). Before the glue dries, fold the fabric between each glue line. You want to create a strip of faux fur with three bumps in it like in the picture. Take 3 three googly eyes. Glue the back of one eye and glue it onto the side of the strip on one of the bumps, as in the picture. Repeat with the other two eyes. Glue the whole of the bottom of the strip (see the pink section on the photo) and glue onto the top of the notebook, arranging it so the eyes are in the middle of the cover looking towards the teeth. And there it is. A mad, hairy, Monster book of Monsters, all ready for your notes on Hippogryphs and Salamanders! Let me know your favourite Harry Potter memories and we can reminisce together.